I purchased a spare headlamp housing and top lamp housing from Chris @ Race Concepts, just send him a PM or friend him on Facebook. This retrofit is caveman easy, but the most annoying part of it was the tedious time it took to slowly cut out the projector hole to make a near perfect fit. 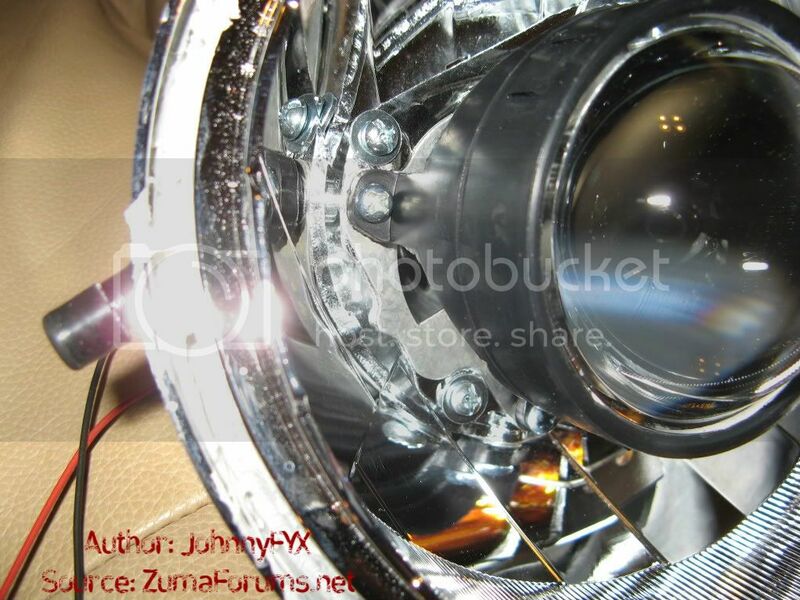 The projector rests against the rim of the hole and sits flush into the OEM reflector bowl. Wire Cutters/Strippers for the electrical part of installation. An old working 350+ Watt Computer Power Supply and Power Supply Tester, used to power up the HID ballast & bulb in your home for light output testing/adjustment/alignment/output cutoff line, color mods, & beam pattern checks. Really it's only useful to someone who plans on making it a hobby and doing retrofits on most of their vehicles and future rides. 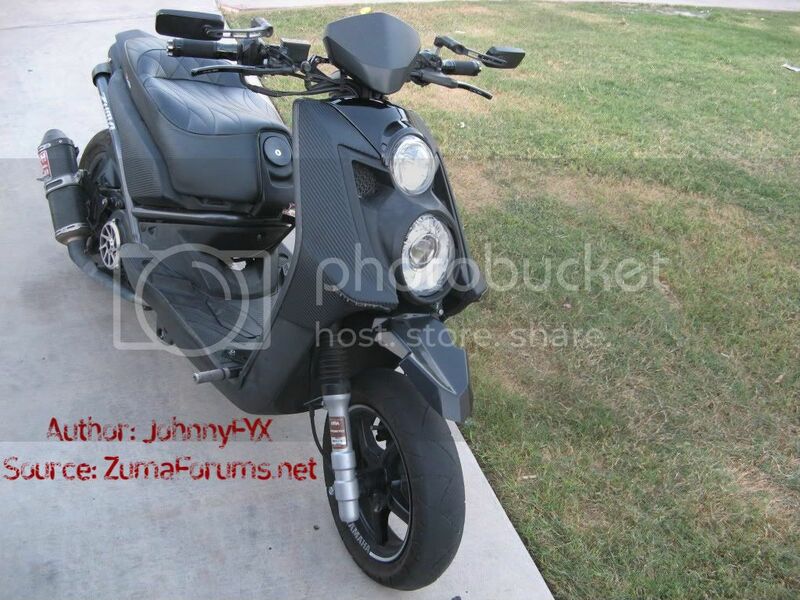 Otherwise you'd just have to mock everything up on the scooter and then power the ballast & bulb using the scooter, which can add more time to your retrofit project. I used the same supplies for the most part that Tungkee used on his retrofit... as these supplies just work the best for this retrofit... I've tried other methods on my previous retrofits with varying success. I purchased all of these supplies at my local Walmart for about $15-20. Microfiber towels to clean any plastic dust and finger prints off the reflective chrome finish. If you must use something to clean the chrome finish, I suggest using distilled water only and thoroughly drying the parts before letting them sit too long... Water spots can be a problem for the chrome finish. It's best to use an air compressor or can of compressed air to blow out any dust particles that may get trapped in the nooks and crannies. Mechanics Latex disposable gloves are also useful to prevent finger prints from getting all over your chrome reflective parts. Clear Silicone Sealant (I used it on the CCFL Halo, to help hold the shroud to the projector, and for additional sealant around the OEM clear lense & the reflector bowl) I also reused the original sealant that the OEM head lamp housing had between the lens and the reflector bowl. This pic shows the white version of the sealant I am using... mine is clear, but it looks the same and is the same brand of sealant. It can be found in the same area as this product. 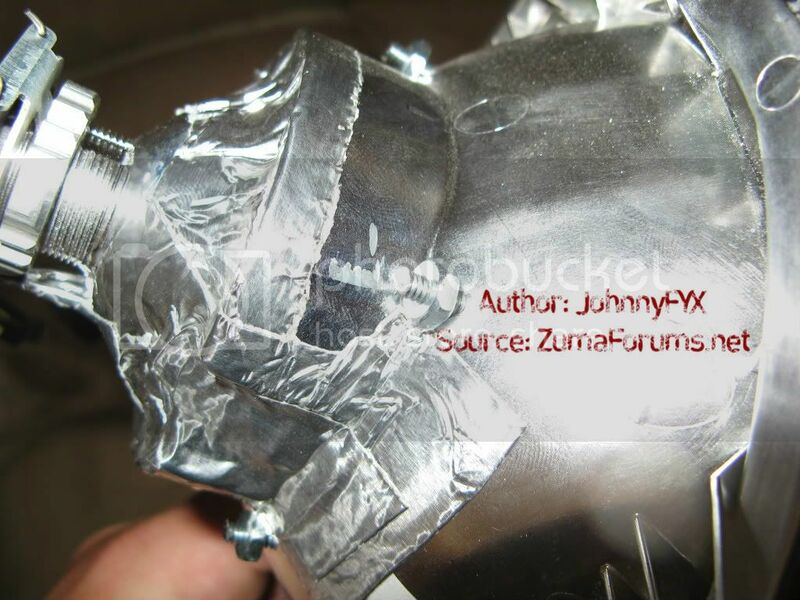 Foil-backed tape with butyl adhesive (Duck Brand Water-Proofing Tape), this stuff works wonders for sealing up the hack job on the back of the reflector bowl. 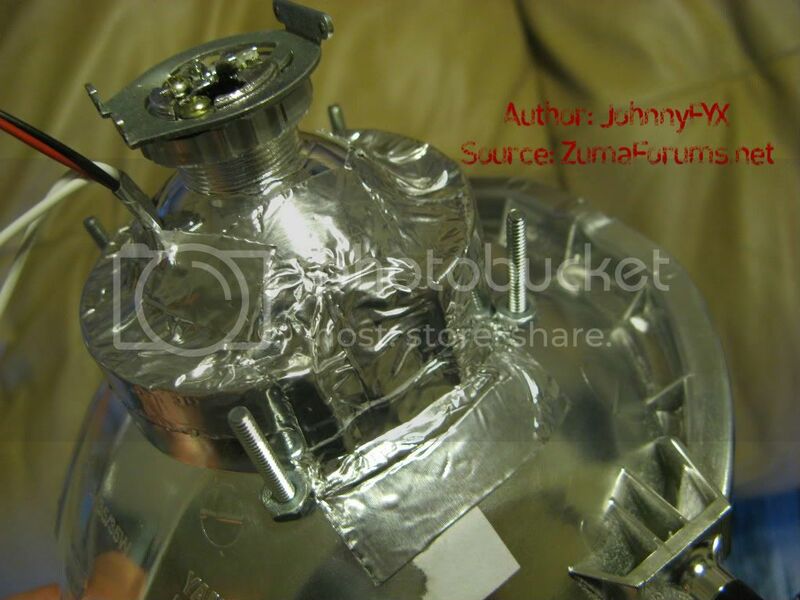 Just be careful to make sure you seal every opening where the reflector bowl meets the projector. I did a couple layers on the sides where the sharp edges were as the tape was kind of weak on those edges... The main purpose is just to seal the majority of the openings. 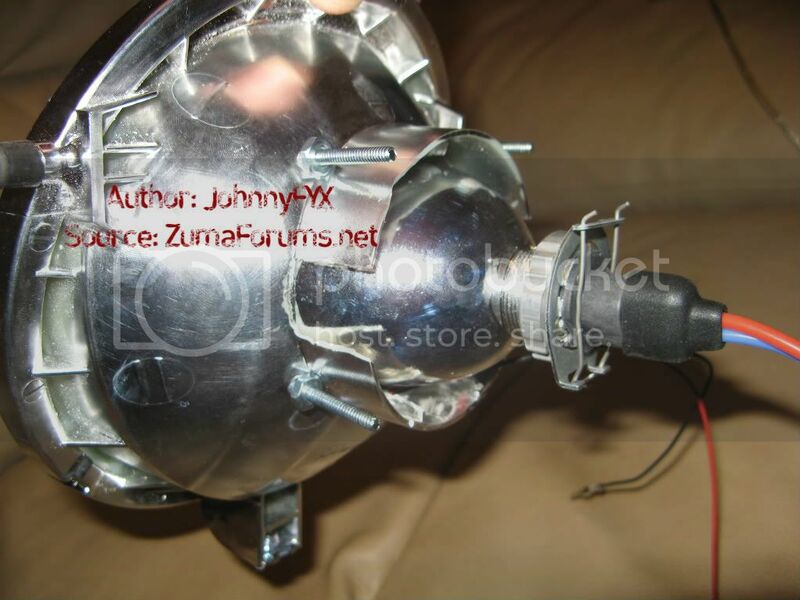 You'll re-use the rubber bulb boot after you mod it to fit around the projector. 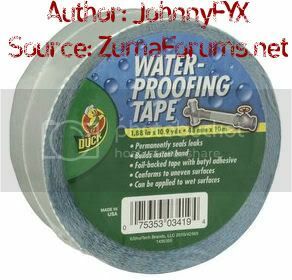 That rubber boot will protect any weak areas of the water-proofing tape. For the back of the headlamp housing where the Screws/Nuts are located, I am sealing it with a gas tank putty sealer called J-B Weld brand WaterWeld Epoxy Stick. They have a few alternative brands... I just recommend getting whatever is cheap and can handle high temps. You'll need to roughen up the plastic near the base of the screw/nut to allow the putty to grab hold and seal correctly. The hardware I purchased at my local lowes/home depot. I used 6/32 1.5 inch screws (1 inch screws would work as well) that came with matching nuts in the package. I also picked up a bag of 6/32 washers, which are used on the head side of the screw to protect the projector mounting points. No need to use washers on the nut end of the screw because the reflector bowl is curved and will serve no real purpose for the nut or the bowl. If you have any questions don't hesitate to ask... I think the pics will speak for them selves pretty well. 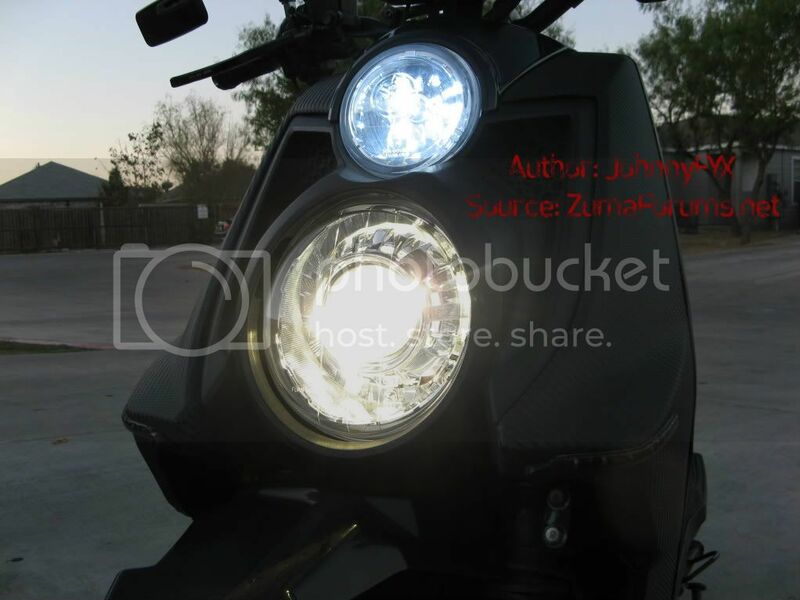 First you'll need to separate the plastic outer lens from the headlamp housing. To do this, you'll need to gather your flat head screwdriver and mechanics gloves and it helps to have a second person to help separate the lens from the housing. 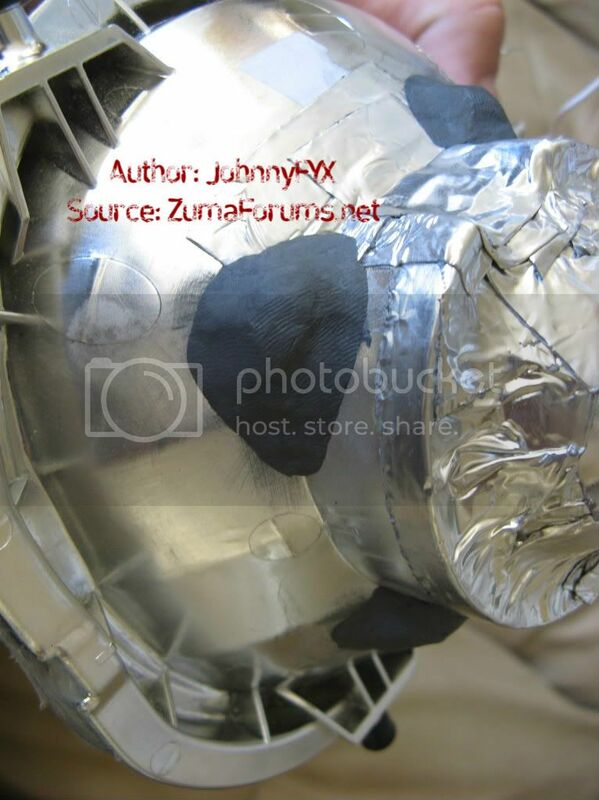 Get a cookie sheet and apply a layer of tin foil to the top of it. Place the cookie sheet in the oven and preheat the oven to 300 degrees. Once the oven is preheated Turn Off the oven and place the headlamp into the oven on the cookie sheet. Keep the oven Turned Off with the headlamp in the oven for 7 minutes and no longer. Have the partner use the flat head screwdriver to separate the stringy butyl adhesive while you hold the two parts and separate them... It may be even more helpful to have a heat gun near by so you can re-heat the stringy butyl adhesive and help further separate the lens from the housing. If you don't have these luxuries, then you'll have to wait till the headlamp cools down completely and then preheat the oven to 300 degrees again and repeat the heating process using the oven. Make sure the oven is turned off whenever the headlamp is inside the oven and only leave the headlamp in the oven for no more than 7 minutes at a time. I didn't take any pics of the actual hole I cut into the reflector bowl, but you'll be able to see how it's cut from the back of the bowl. When I trimmed the hole, I used a dremel and cut from the back side of the bowl. Most of my cutting was done by just eyeballing the shape and drawing it out with a permanent marker so I could follow a trimming line. 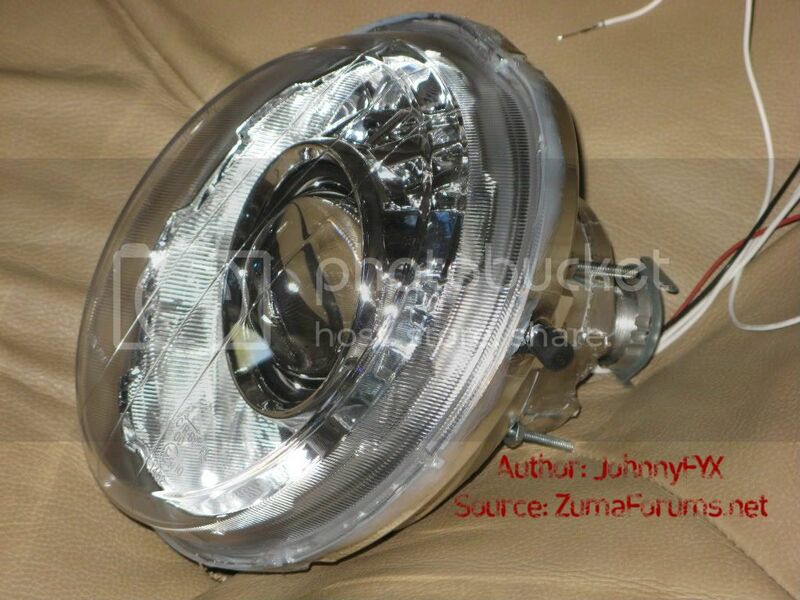 Here's the front where it's more difficult to see the hole cut into the reflector bowl. An angle shot to get a better view of how you need to trim the circle rim to make the projector fit through properly. And a close up to show how I made a little more room for the wires to pass through. 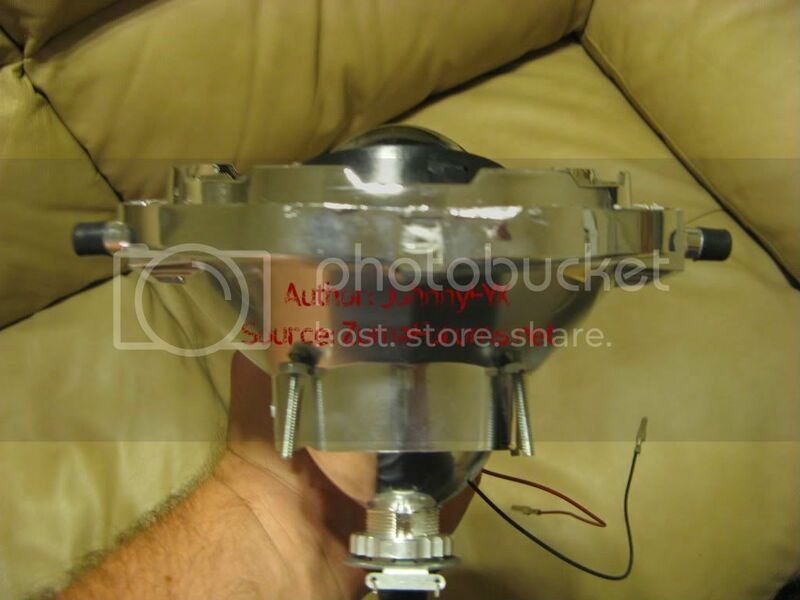 When mounting the projector to the reflector bowl, you'll need to make sure the projector's mounting points rest completely flush on the back of the reflector bowl as shown in this pic. 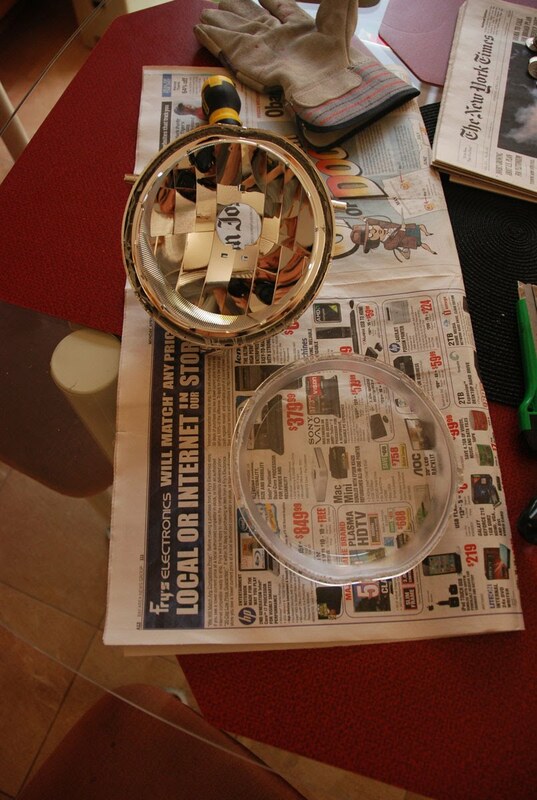 To drill the holes just line up the projector so it's perpendicular with the reflector bowl's chrome lines/ridges. 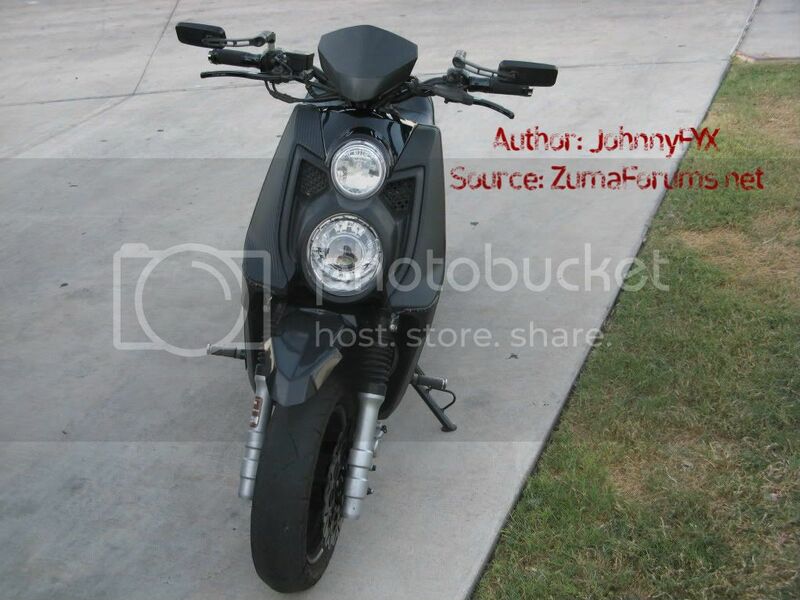 It should also be lined up level/parallel with headlamp housing's pivot mounting points on the outer sides. There are a few other reference points that help with finding a good level alignment prior to drilling your projector mounting holes. To mark your holes you can use a scoring pick or ultra small drill bit to scratch a small mark on the chrome. After all drill marks are scored, then remove the projector and drill your holes... Start by drilling at an angle that is perpendicular to the curve of the reflector bowl at the marked drilling spot. Then once the hole is drilled through and while the bit is still in the hole and spinning, tilt the drill so that you're drill is now perpendicular to the base of the reflector bowl. 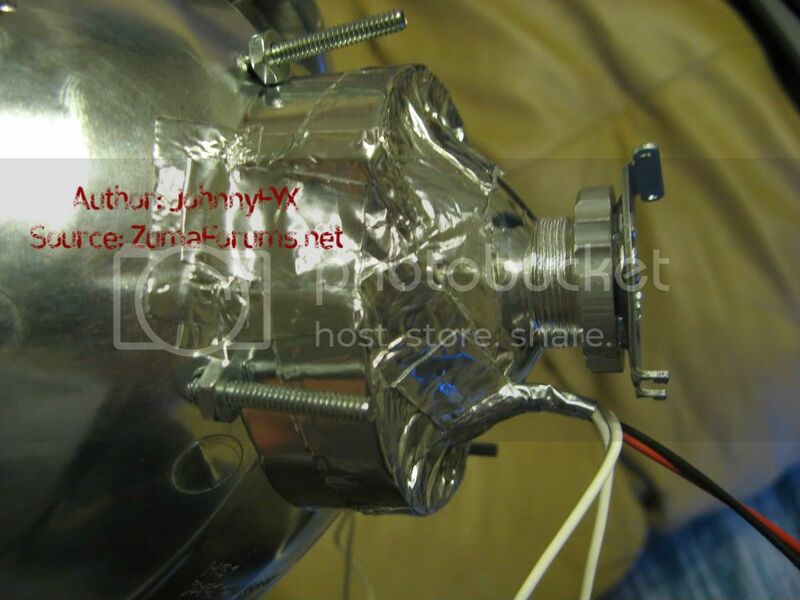 The objective is to allow the mounting screw to go through the reflector bowl from front to back... not at the original extreme angle of the drilling location that was required so the drill bit doesn't slip down the curve of the reflector bowl. 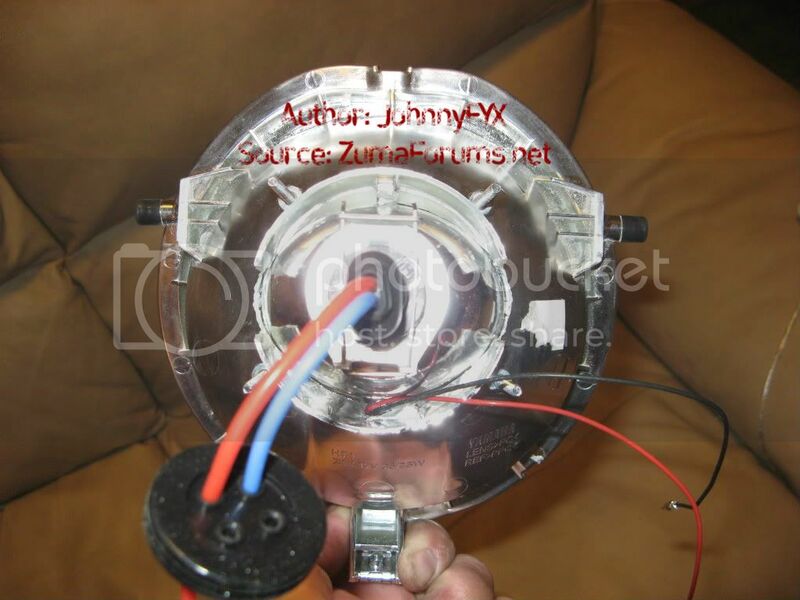 Once you have a good hole trimmed out and holes drilled out for the screws to pass through, the projector should protrude no more than what you see in these pics... 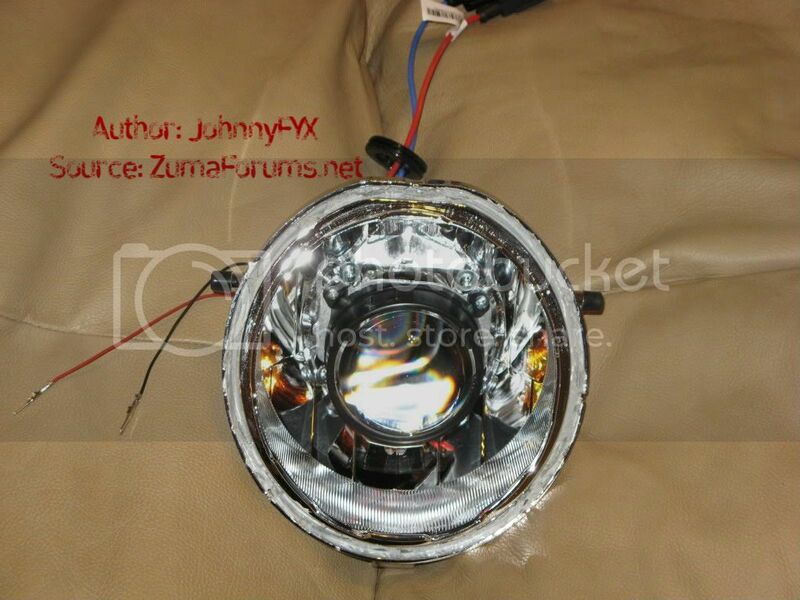 These pics are profile photos so you can see how much room you have to work with (it's not much, maybe a 1/4 inch or less before the shroud or projector hits the headlamp outer lens). After you have the shroud trimmed to fit, you can mount your CCFL halo. I just used a few pieces of scotch tape to hold the CCFL halo in place and then applied some clear silicone to permanently mount it to the shroud. Be sure not to block the front of the halo where the light shines through the shroud's vents. I then took the tape off after it dried and applied more silicone in the areas where the tape was at. 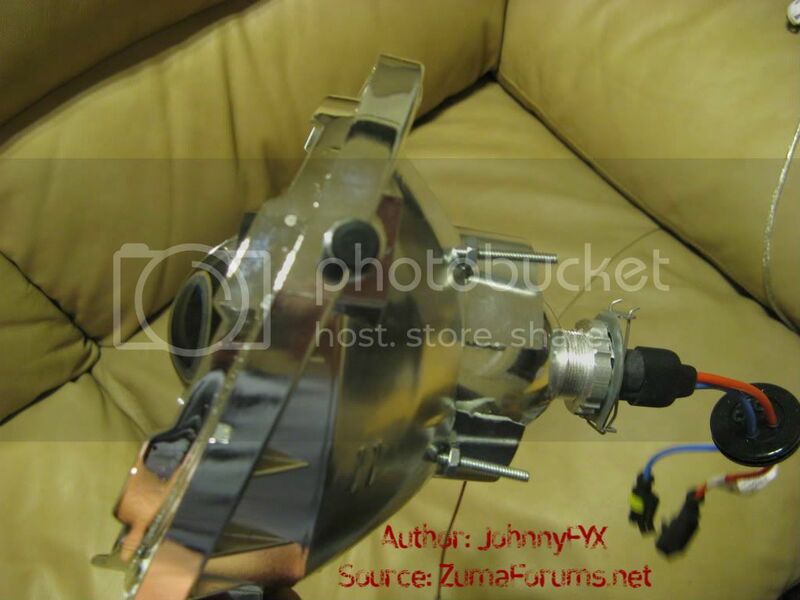 Here's what the shroud looks like once it's mounted properly to the projector/reflector bowl. I also used a thin layer of clear silicone to hold the shroud onto the projector for extra insurance. If you do this, make sure everything is cleaned from finger prints, dust, fibers, etc. and the fitment & alignment of the shroud is correct before applying the silicone to the projector. Apply the silicone around the projector about an 1/8th inch away from the front most edge of the black projector lens support frame. The shroud has about 1/4 inch of friction fit surface area called the centric compression ring. 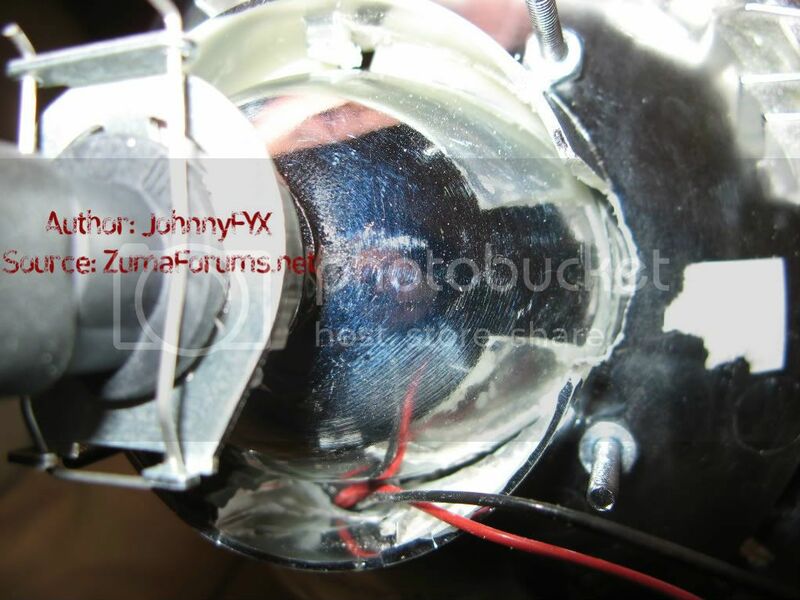 It's a black plastic ring that holds the shroud firmly onto the rim of the projector near the lens. This surface area is where the silicone must make contact in order to create a more secure hold between the parts. I'd suggest only using a thin layer of silicone as too much can become an issue. To seal the rear of the headlamp/projector housing, I used the Duck brand Water-proofing Tape, and applied it in a couple layers on the sides where the cuts are at on the rim. The tape is a little difficult to work on rounded surfaces, so just make sure that any creases are flattened down and if you suspect a possible leak due to a crease or tear, just add another layer of tape. Try not to put more than one layer of tape on the circular rim because the rubber bulb boot needs to fit around the rim and you don't want it to get too large in diameter. The pictures will provide some examples to what's needed. The wires are a big source for leaks, so just tape the wires against the projector with the water-proofing tape and then use your nails to create a good seal around the edge of the wires. Then go over that with another layer of tape until it's all sealed up. I'd advise against using any sealants on the back where the gaps are between the projector and the reflector bowl. This is near the hottest part of the projector and sealant can off gas chemicals when exposed to extreme heat. The chemicals can cause the chrome or the outer lens to haze or fog up. That's why the foil-backed butyl adhesive tape works so nicely here as the original sealant used on the outer lens and headlamp housing is butyl adhesive sealant. Next, you can trim the screws with a dremel or cutters and seal the rear screws/nuts with the J-B Weld WaterWeld putty. You'll need to roughen up the plastic near the base of the screw/nut to allow the putty to grab hold and seal correctly. I prefer using putty vs. the standard J-B Weld liquid version as the liquid version tends to run/drip and that can ruin a retrofit real quick. Cure time varies depending on the brand of putty you use... I think it's like 20-30 minutes for WaterWeld and others may take up to 1 hr to cure, so let it sit until it cures and you will be ready to move on. 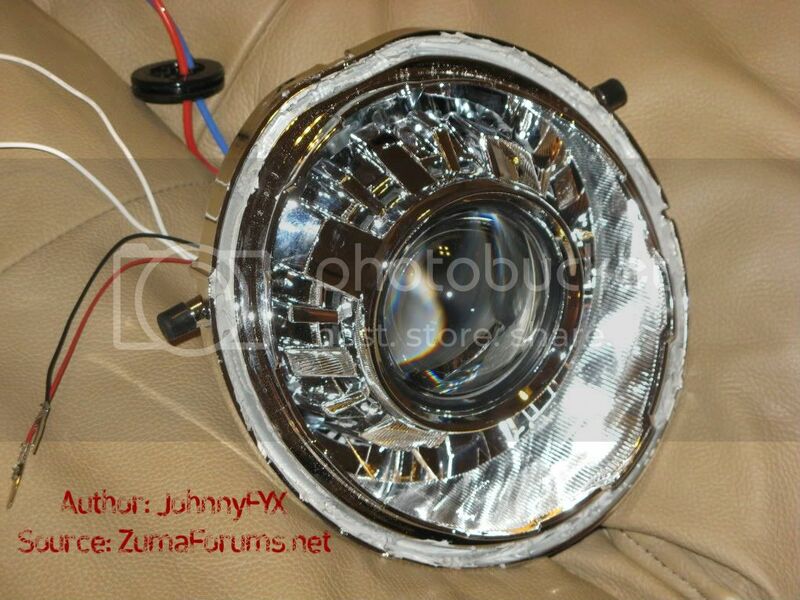 After the screws/nuts are sealed you can then seal the outer lens to the headlamp housing. Do one last check to make sure no finger prints, fibers, dust, or debris is on the lens, projector's lens, reflector bowl, or the shroud. Wear some disposable latex gloves and a dry microfiber cloth to clean everything. Using a compressed air can can also help. Avoid using any liquid cleaners and/or water. 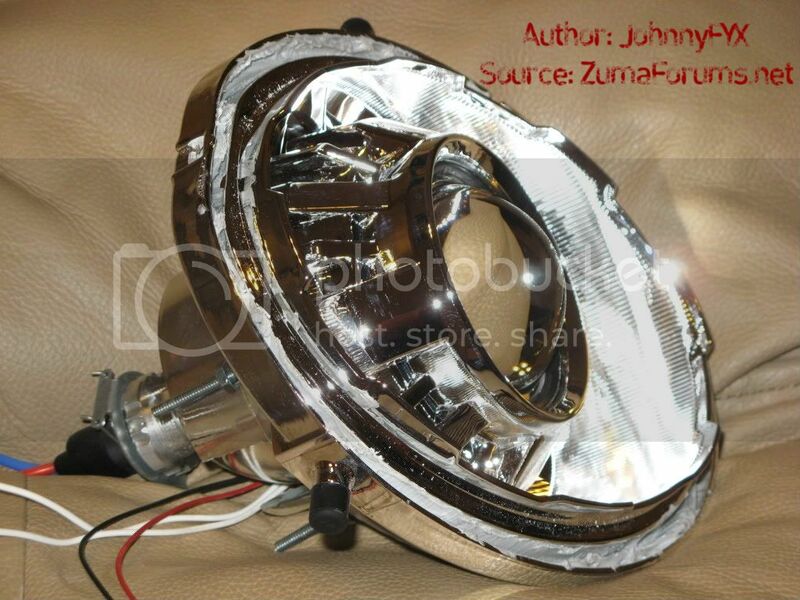 Align the outer plastic lens onto the headlamp housing so that once it's heated it can be pressed together easily. Preheat the oven to 300 degrees. Once the oven has been preheated, Turn Off the oven and place the entire headlamp assembly on a cookie sheet that has aluminum foil on top of the cookie sheet inside the oven for 5 minutes. Pressing the lens onto the headlamp housing should only take a few seconds and the 5 minutes it takes in the oven is more than enough time to warm up the original butyl sealant and press the parts together for a great seal. If you want extra certainty that it's water tight, use the clear silicone sealant after the housing has cooled down to apply a thin layer of sealant around the perimeter where the small gap is between the two parts. Let everything dry over night for a good cure before using the headlamp. That's about it! I'll add more pics once everything is wired up to show you the performance output differences between the standard BWS Asian Reflector headlamp and the Retrofitted Morimoto Mini H1 (projector version 4.1). When I was testing the output on the latest version 4.1 Morimoto Mini H1 Projector, it has some performance improvements over the output shown in the picture that Tungkee provided. Some that I noticed right off the bat is an even color band across both sides of the step and a more centered hot spot directed at the bottom of the step vs the top or side of the step. It also has a larger variety of colors from vibrant purple, blue, and orange depending on how far away you are when viewing the projector's output. I was definitely impressed by this latest projector version from TRS. Hope yall can make use of this great info! The Top Lamp housing Matchbox Mini H1 Projector Retrofit will be added to this thread once it's completed. 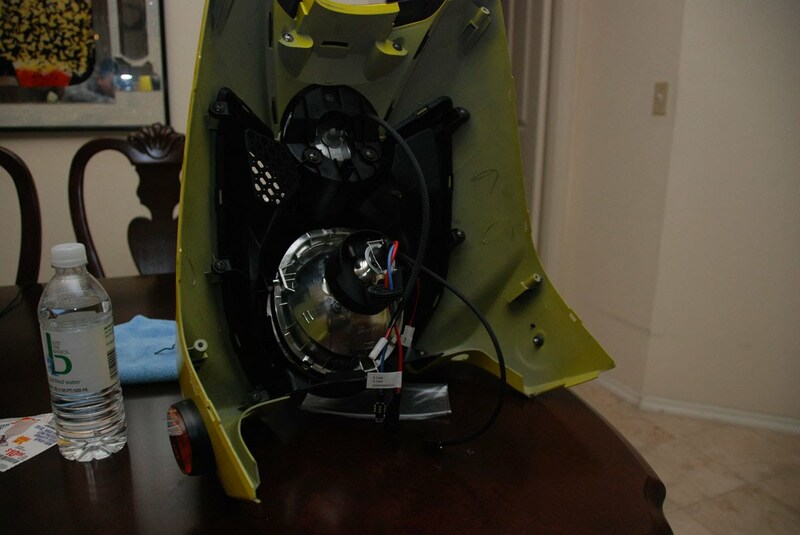 Thanks goes out to Tungkee for the HID Projector Retrofit inspiration and being a pioneer in the BWS/Zuma 125 retrofitting community! This is the end result, a clean colorful cutoff line with amazing output! 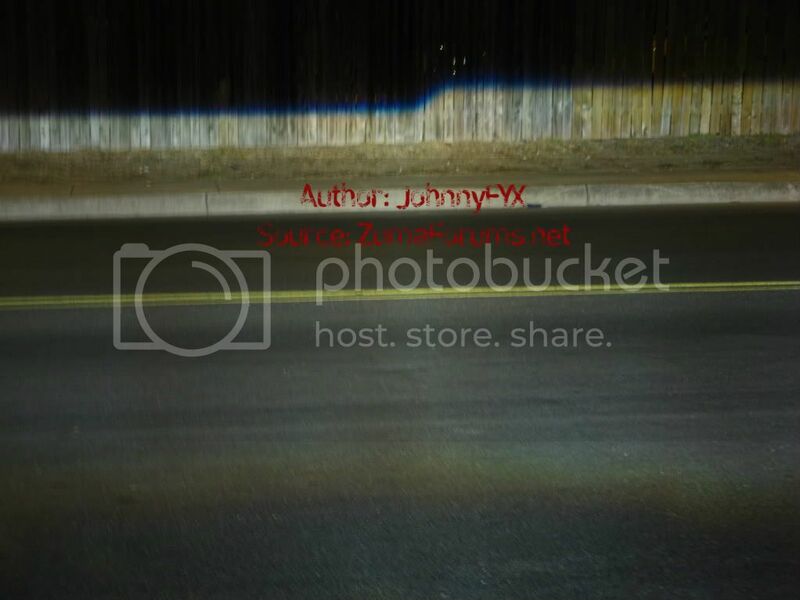 Last edited by JohnnyFYX on Wed Sep 28, 2011 8:37 am, edited 12 times in total. Hawt! Are you are using a projector for both top and bottom lamps? What ballasts are you using? I'm using a cheap made in china ebay 35w ballast. If the ballasts are the slim digital hi/low or bixenon type, then they are pretty much all the same quality no matter where you buy them from. The bulbs on the other hand have a much more random quality control issue than the ballasts, so get your bulbs from TRS. 4300K H1 HID Bulbs for the Morimoto Mini H1 bi-xenon projector will do the trick. I'd go no more than 6000K if you want a more white output than a slightly yellow output. IMHO, the 4300K is white enough and far brighter than the 6000K bulbs. 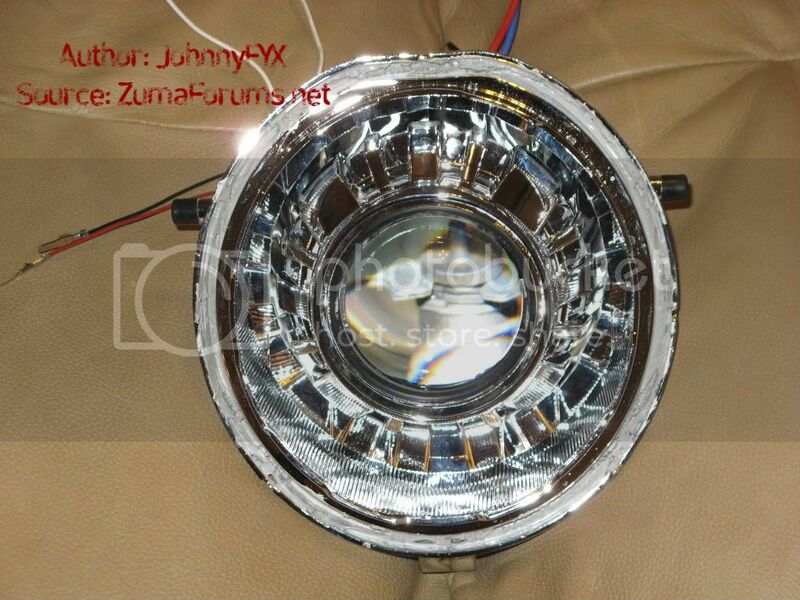 I will be doing both the top and the bottom headlamp housings with bi-xenon H1 projectors. The top is a TRS Matchbox Mini H1 projector and the bottom is a standard Morimoto Mini H1 projector, and both are Bi-Xenon projectors that allow both Hi beam and Low Beam output via a built in solenoid. 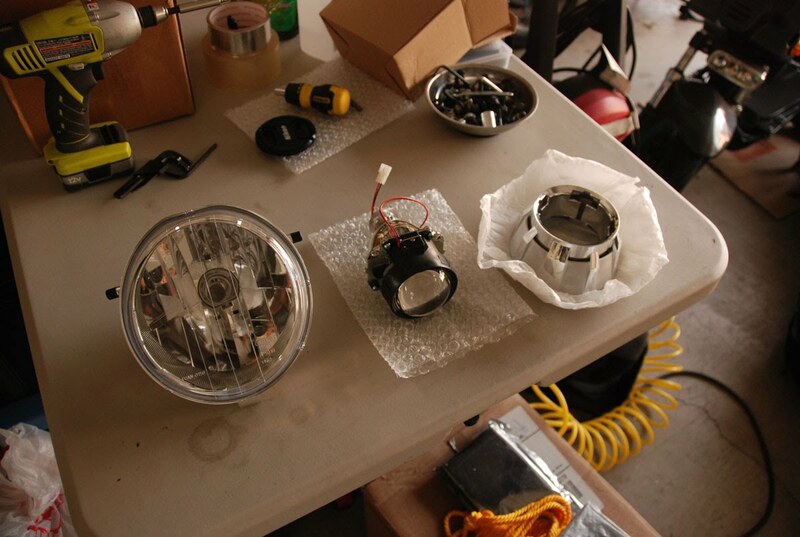 The top lamp retrofit will take more time and R&D to figure out how to make it work, so no guarantee's that it will be successfully retrofitted. No harm in that issue, because I can always put the matchbox mini h1 projectors up for sale on ebay or the TRS forums. Here's some pics for comparison for those who would like to know rather than searching hidplanet.com/forums for info./pics. Height - 2.1 to 2.2"
Last edited by JohnnyFYX on Thu Dec 27, 2012 11:58 am, edited 1 time in total. So here's some preview pics of it installed... I haven't wired up the hi beam or the halo yet, so I'll have more pics when that's finished. yeah the cutoff line has a step in it to light up the right side of the road so you can see the signs, pedestrian traffic, and deer/animals. When aiming always make sure the lower part of the cutoff line is 2 inches lower than the height of the projector at 25ft away from the projector when aimed against a wall on a level ground. 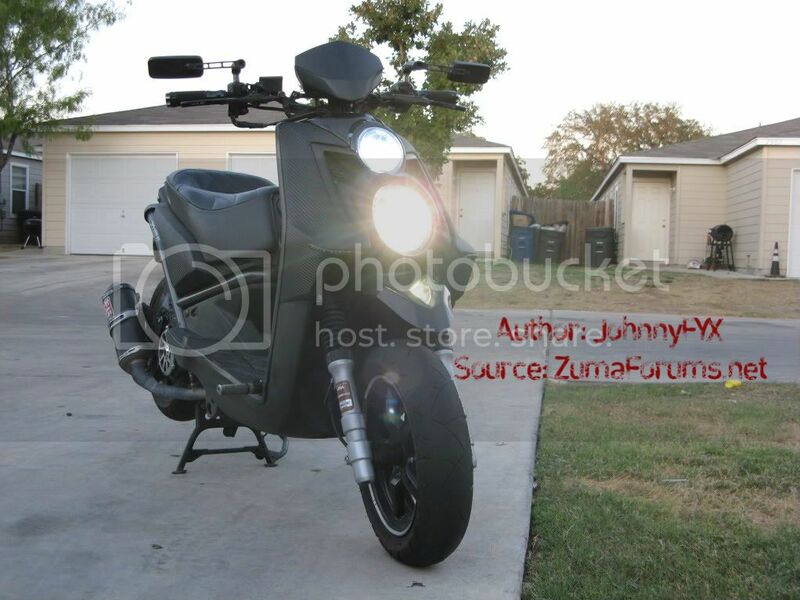 It will take two people to correctly aim the headlight as one person should be sitting on the scoot and holding it upright while you make your measurements and tape lines on the wall. 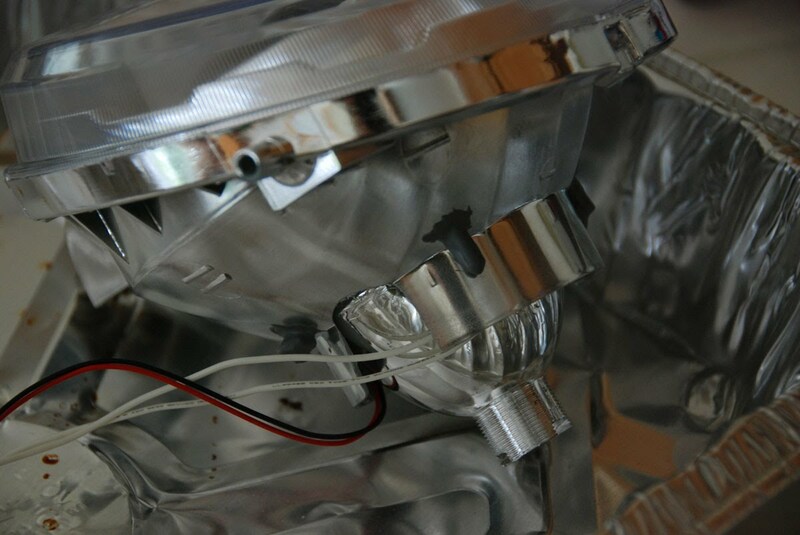 Then just loosen the bolt on the bottom of the headlamp and adjust the aim. Once it's aimed correctly tighten the adjustment bolt and you're good to go. Here's a couple illustrated ways to align the headlights correctly. This is my method as it's a lot more accurate as long as you're scooter is on level ground. 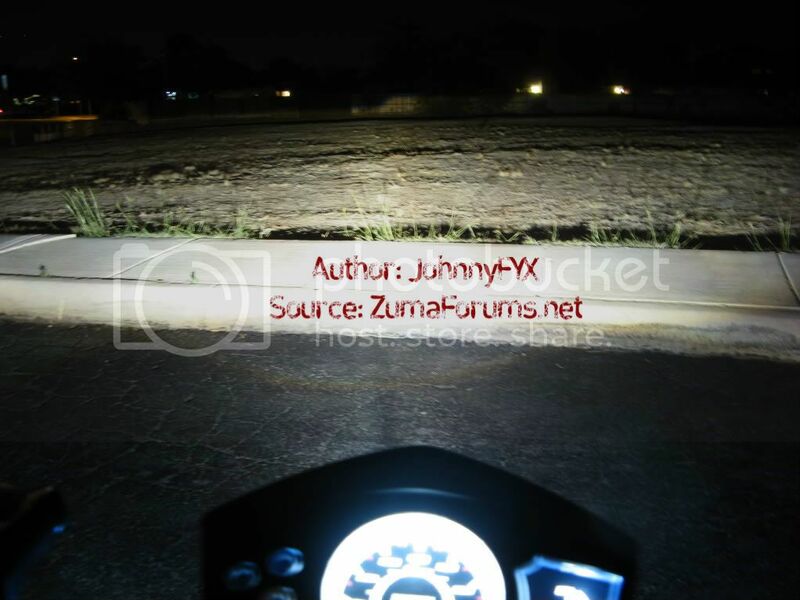 Just make sure you are facing the scooter so that the left side of the scooter is parallel and next to the wall as shown in the picture. The US spec. projectors have a lower step that should always be on the left side and a higher step on the right side. 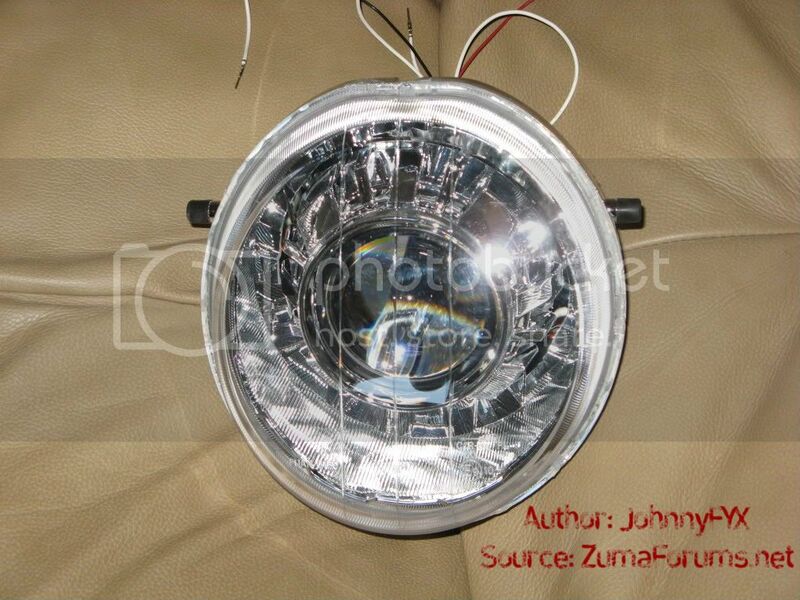 The lower step is the portion of the headlight beam that should be considered when aiming the headlamp. 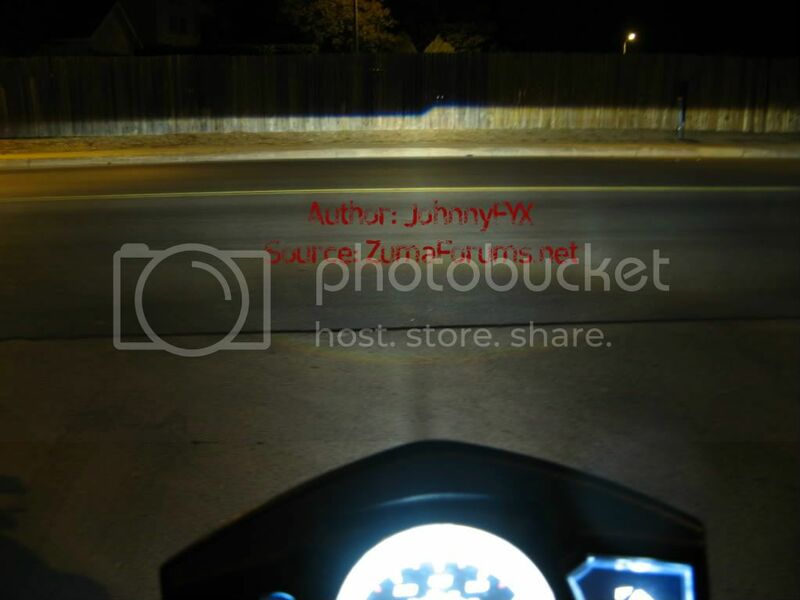 As long as the scooter is oriented in this way against a wall, you'll be aiming the headlight using only the left half or "lower" step of the headlight beam. This is an alternative method, but it can be less accurate due to the fact that most pavements near a building are designed to slope higher nearest the building to allow water to run down away from the building when it's raining. Aiming on level ground is crucial to getting it done correctly. 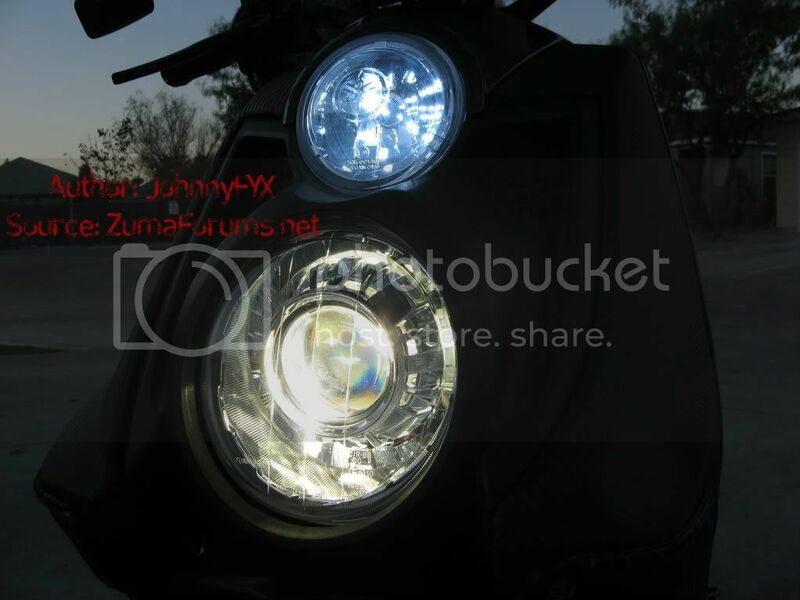 If using this method, you'll also need to consider only the lower step of the projector when aiming the headlamp. This picture shows a 15 ft distance, but that is a typo... it should also be a 25 ft distance away from the wall, but perpendicular to the wall and the lower step should be measured as 2 inches lower than the initial height of the light source (the projector). The dimensions you should be most concerned with is the distance from the mounting points to the front of the projector and the distance from the mounting points to the rear of the projector. Both of these measurements should be very close to the Morimoto H1 bi-xenon projectors. Too long at the front 1/2 of the projector and the projector will come into contact with the outer plastic lens. Too long in the rear and it may not fit if the rear of the projector makes contact with the frame behind the front cover or something else. how did you ever find that? Wow, um that sux... looks like this isn't the only How-To they copied... At the bottom of that page, there's a list of other threads some of which were also jacked from ZumaForums.net. I honestly don't care if they jacked my How-To's, I'm all for sharing the wealth of useful info. It would be nice if they would at least document or give credit to the origin/source and who did the work. 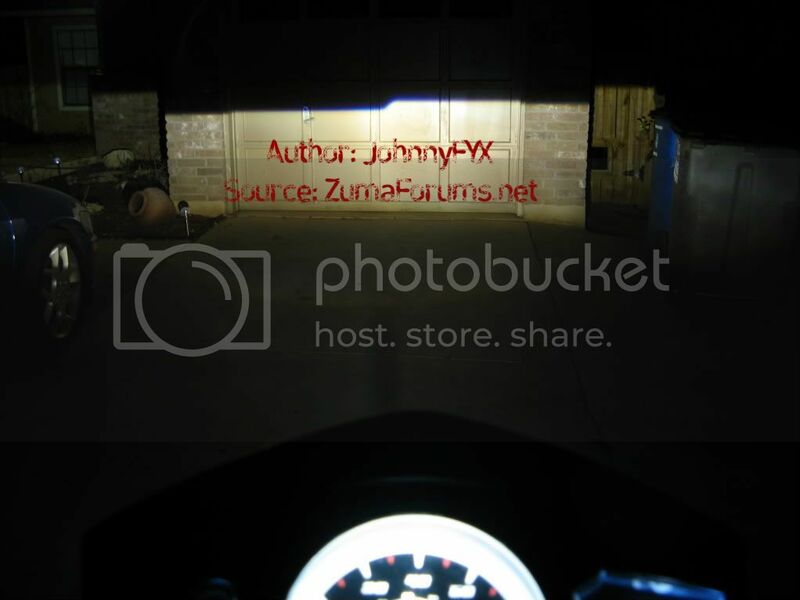 I will modify all of my pics to include a 'Signature' Watermark and also add the ZumaForums.net website to the watermark... This will be my project for tomorrow... I'm tempted to do the other more sinister prank, but I'll play nice. lol.